Written on June 30, 2005 by Kevin. MSN.com recently had an article about parents most embarrasing mistakes. Definetly a great laugh for this thursday morning. My wife can agree that I sometimes spaz out so I can only imagine the things that I may do once the baby arrives. I am all about using what is available around me so that worrys my wife too I bet. My newborn daughter would spit up occasionally, like all babies, but one day when she was just 3 weeks old, she began to projectile vomit. I swear it shot from her mouth 4 feet across the room. Ironically, I had just watched 'The Exorcist' the night before, so I was positive she was possessed. I couldn't believe a tiny baby could have the ability to do this naturally. Hysterical, I called my parents, the emergency room, and a priest. When I got to the emergency room, the doctor explained it to me, and told me I was probably just overfeeding her. My priest laughed so hard he had to sit down. I found the following link while surfing around today. It is a great read for any pregnant women especially in Arizona. When the temperature goes up, so does the risk of serious injury for pregnant women, a new Canadian study has found. The Crib Tent does its job. Written on June 29, 2005 by Kevin. We have 3 cats and wanted a way to make sure the cats were going to stay out of the baby crib. 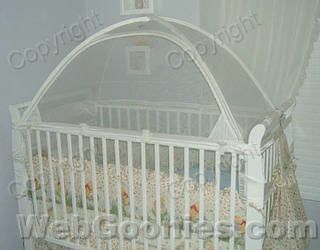 The only solution it seems is buying a Crib Tent from Tots in Mind. We bought one of these the other day and immediately put it up(Its worse than putting up a normal tent). Anyways, yesterday it seems that while talking to my wife on the phone one of our cats decided to try to jump into the crib and made direct contact with the new found tent. We had already introduced her to the tent but she must have not realized it was there because she smacked right into it like an accordion and fell to the ground. My wife says it was like watching a real life cartoon where the character runs into a wall. The picture off their website shows a cat standing on top of the tent and from what I can see, I believe it. It seems to do a good job keeping the cats out and should help keep the baby in when it grows bigger. Mr. Clean makes me Mr. Happy. Written on June 26, 2005 by Kevin. Like many dads I assume, I do a majority of the cleaning around the house. This doesn't exclude the kitchen where I do the dishes, clean up and sometimes even cook(when my wife lets me). One thing that I have found that makes the cleaning much easier is the Mr. Clean Magic Eraser. I have received a few of these free from sample websites and they are extremely useful. They seem to clean up all the stains on the kitchen counters in no time. I haven't found anything in the past that can take care of Kool-aid stains and these seem to do a great job. One of the best things is this doesn't leave a chemical smell in the room. I haven't used this for anywhere else in the house but I assume it would work well elsewhere. Definetly a big daddy thumbs up for this product. Written on June 23, 2005 by Kevin. Months ago we were given a suggestion to get the kitties ready for the new baby by slowly bringing in new baby toys, crib and other supplies. We have had this bouncer for over 2 months and today we found that it is getting usage before the baby even has arrived. 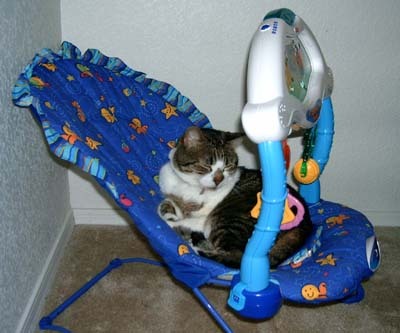 Our oldest kitty tested the bouncer and approved of it. She seemed very comfortable which I guess is a good sign we picked out a winner. We figured the kitties would attempt this and tried to keep them out by putting a doll in it so they would stay off of it and to also get them used to having something in it. Guess we need to hide it away until the real baby arrives. As you can tell in the following picture, my wife is a bit anxious for the baby to pop out. 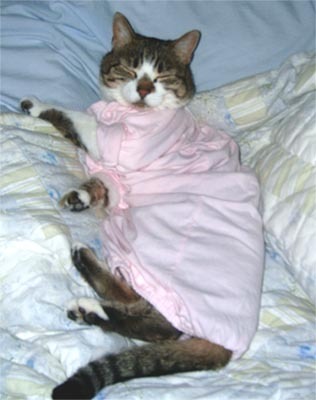 She has attacked the kitty cat once again and put clothing on her. The baby clothes this time. I don't know what the both of them are going to do for the next 4 months or so..
EBay the place to buy baby related items? Written on June 22, 2005 by Kevin. Recently my wife took the chance to search on eBay for baby clothes and other related items. It certainly appears that there are bargains to be found within this category because we were able to find a lot of 14 baby sleepers and gowns for only $22 shipped. Now I have to admit these were used but from the picture and now that I have them in my hands, they are still in great quality. I think the average parent can acknowledge that this is a great deal. Larger, more expensive items are also sold at low prices it seems as well including new breast pumps which I found selling for $25 shipped rather than $40 in the store for the same item. Now you may be thinking, when you buy online, Its difficult to return it if you don't like it. Well that is also the case in the store, they refuse to let you return a breast pump even if it has never been opened. Written on June 19, 2005 by Kevin.